Beyond the Gates 2018 will take place in Bergen, Norway on August 23-26, 2018. Mysticum, Bölzer and Eternal Champion are among the bands that will perform at Beyond the Gates 2018 festival. Oration Festival 2017 will take place at Húrra in Reykjavik, Iceland on February 17-18, 2017. Mgła, The Ruins Of Beverast and Misþyrming are among the bands that will perform at Oration Festival 2017 festival. Oration MMXVI Festival will take place at Húrra in Reykjavík, Iceland on February 19-20, 2016. 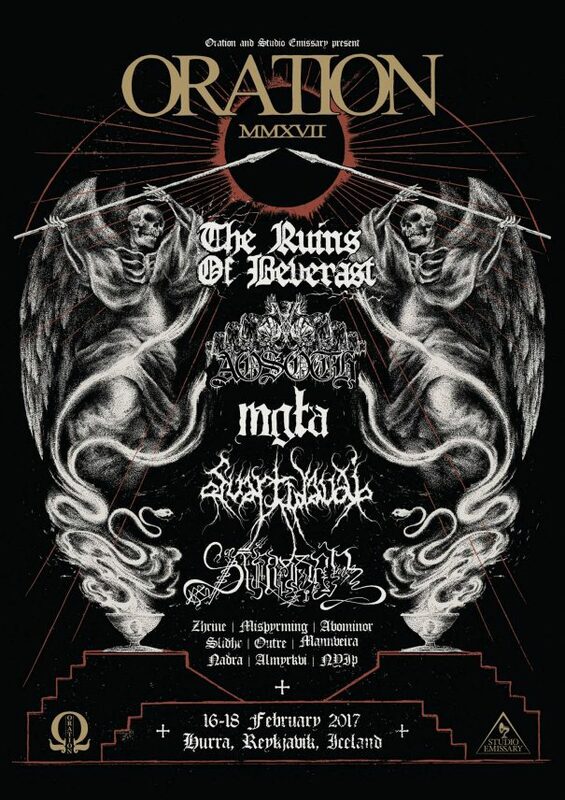 Svartidauði, Malthusian and Slidhr are among the bands that will perform at the Oration MMXVI Festival festival. Eistnaflug 2015 will take place in Neskaupstaður Gymnasium, Iceland on July 09-11, 2015. Carcass, Enslaved and Kvelertak are among the bands that will perform at the Eistnaflug 2015 festival.